Located on the northeast side of Indianapolis at the intersection of Fall Creek Road and Shadeland Avenue, the Golden-Burke Scout Center has meeting rooms of various sizes for your next meeting, training or Scouting activity. The building may be rented by both Scout and community groups seven days a week. All meeting rooms are rented in preset, four hour intervals. However, you may rent as many 4 hour blocks of time as needed. Reservation times are 7:00 - 11:00 AM; 11:00 AM - 3:00 PM; 3:00 PM - 7:00 PM and 7:00 PM - 11:00 PM. Your rental time must include set-up and clean-up of your meeting. For questions or more information, please contact Reem Okar, (317) 813-7094 or reemokar@crossroadsbsa.org. Large meeting room seats 75 theater style or 50 classroom style with folding tables and stacking chairs. AV equipment, whiteboard, tack strips, sink and snack area included. The Education Station Overhang is a large, covered area outside of the Wilmeth Room and adjacent to McCrory Patio. Gravel floor. Perfect area for outdoor programming or training. The Vectren Corp Amphitheater and Peduto Memorial Fire Ring are a beautiful outdoor setting. The fire ring with seating overlooking the pond is a perfect location for an outdoor meeting or gathering. No wood is provided. Walking trail with activity/fitness stations. Travels past the Golden-Burke Scout Center, through our woods and around the pond. Units may reserve use of the path for a meeting, activity or advancement work. Open patio outside of Wells Hall and adjacent to the Education Station Overhang. Permanent benches and tables with umbrellas. Perfect for outdoor programming or to extend your event outside to enjoy the beautiful pond and grounds. Large lobby area with soft seating and small table and chair groupings. Can hold 75 for a stand-up reception or display area. Fireplace use is not included in rental. May not be rented during business hours of 8:30 AM - 5:00 PM Monday through Friday. Non-BSA renters must complete and submit a Letter of Agreement, Hold Harmless Statement, and Certificate of Insurnace to the Crossroads of America Council within 30 days of completing their reservation or the reservation will be canceled. They must also comply with all BSA policies listed below. A security deposit is charged to cover any possible damage, loss and general cleaning charges. This is refunded if the facility is left in good condition and cleaned according to the Cleaning Guidelines. All renters are responsible to replace or repair property, and for equipment damage or cleaning costs they might incur above and beyond the security deposit. Facilities and camps are provided by the council to support unit programs, district activities, council events and community organizations. 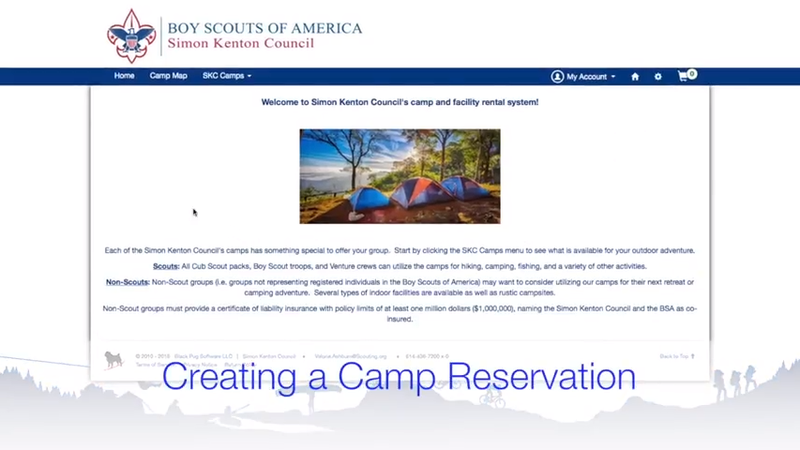 The council facilities and camps are a large financial obligation of service by our council. Enjoy these facilities, protect them, conserve and give everyone the chance to enjoy a Scouting adventure. All activities in council facilities must be designed to be a positive contribution to the training and growth of every youth, using the proven purpose and methods of the Boy Scouts of America. Understand that the Scout Oath and Scout Law are the guiding principles of our camps and are the responsibility of every adult leader to demonstrate by their own personal example. A small usage fee is charged to cover normal wear and tear to the facility. Rental fees are very nominal - thanks to Friends of Scouting and United Way support - but are important to the upkeep of the buildings, equipment and grounds. Rental facilities must be cleaned following the Cleaning Guidelines All renters are responsible to replace or repair property, and for equipment damage or additional cleaning charges they might incur. - Check-in and check-out of camp per the instructions for each location. - All groups are responsible for set-up and clean-up of any facility used, following the Cleaning Guidelines published separately. - Use only those facilities that have been reserved and paid for. Should it be found that additional facilities were used, additional charges may be incurred. 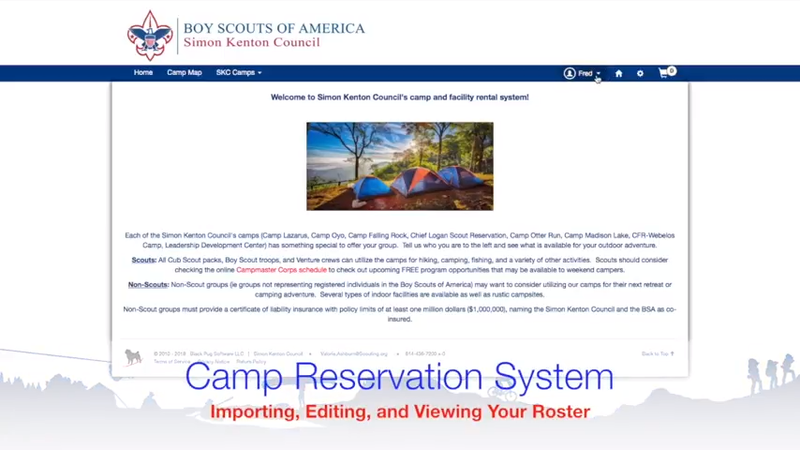 - We can not rent summer camp program equipment or supplies beyond the items listed in the Quartermaster section of this site. Some basic camping equipment and program supplies can be rented, however. Any equipment available to rent must be reserved through the online reservation system under the Quartermaster section. - Smoking is not allowed in any council building and only in designated smoking areas on Scout property. - Cook only in kitchen provided areas of cabins and other buildings. - No open flames in any building. Build outdoor fires only in the provided areas. Please clean up fire scars. - Don’t dig tent trenches or keyhole fires. - Show proper care with propane or white gas stoves and lanterns. - No alcohol or illegal drugs are allowed on any Scout property. - No firearms, weapons or fireworks are allowed on any Scout property. - Pets are prohibited in any Scout facility or camp. - Park all vehicles only in the provided parking lots. - Scouts cannot travel in the bed of trucks. All occupants of a vehicle must use a seat belt at all times. - Follow Youth Protection guidelines. - Follow any posted guidelines in any council building or camp or verbal instructions provided by the ranger. All renters are responsible to "leave camp better than they found it". Please report any damage. Failure to comply with any of these guidelines may result in additional charges. If your rental is during normal business hours (8:30 AM to 5:00 PM Monday thru Friday) please check-in at the Volunteer Services Desk upon arrival. If renting outside of normal business hours, you must come to the Golden-Burke Scout Center one business day before your rental to be given a key card and the security procedure for entering and exiting the building. If you arrive earlier than your rental time or stay after your rental time, you will charged for the additional use via your security deposit. Please see the Facility Use and Cleaning Policy. If you arrive earlier than your rental time or stay after your rental time, you will be charged for additional use via your security deposit. If you are issued a key card, this must be returned to the Golden-Burke Scout Center within 48 hours of your rental or you will forfeit your security deposit. Cancellations made within thirty days of the reservation date are not subject to a refund. Cancellations made more than thirty days before the date of the reservation will receive a full refund. All renters must follow the cleaning guildelines below and are responsible to replace or repair property or equipment damage or cleaning costs they might incur. - Empty all trash containers, reline if bags provided, and deposit all trash in the dumpster, "pack it home", or dispose of as directed by the ranger. - Remove all personal items from all rental locations. - Indoors or outside, make sure all fires are out and clean up fire scars. - Follow any camp specific cleaning guidelines provided by the ranger. - All groups are responsible for set-up and clean-up of any facility used. - Renters are responsible for the cleaning and condition of other areas in the facility used by their group members beyond what may have been reserved to include small meeting rooms, restrooms and kitchen. - Wipe down all tables and hard chairs with cleaning solution and paper towels found in the janitor’s closet. - Return all tables, chairs and other furniture to their original position. - Sweep or vacuum floor, mopping any spills if needed. - Erase all white boards. - Make sure water is shut off in any meeting room, restroom or kitchen. - Make sure all windows are closed. If room is equipped with window blinds or shades, make certain they are left closed. - Turn off coffee warmers and coffee pots. - Turn off all lights. - Make sure no outside doors are propped open. - Remove all food from the refrigerator and freezer. - Wash and put away any dishes used. - Make certain all appliances are turned off, including coffee maker. - Wipe down all surfaces, including the inside of the microwave. All renters are responsible to "leave camp better than they found it". Please report any damage. Failure to comply with any of these guidelines may result in the loss of security deposit or additional charges.